Businessman Graham Keegan, who is also a parish councillor, warns Woodhall Spa’s infra-structure cannot cope with the hundreds of new homes either already built or awaiting planning permission. Mr Keegan has set up a Facebook page and has already gained support from many other residents and the headmaster of the village primary school (St Andrew’s) who says it could not cope with a ‘significant number’ of additional children. The campaign coincides with Woodhall Spa Parish Council objecting in the ’strongest possible terms’ to plans for 150 new homes on a site off Witham Road. Mr Keegan said: “I feel we are under siege from developers and talking to other people they feel exactly the same and that is why I have launched the Facebook page. “We’ve already seen large scale developments in Woodhall Spa and quiet frankly, a lot of people would say the village is already spoiled. Mr Keegan said Woodhall Spa had been allocated around 300 new homes in East Lindsey District Council’s Local Plan. However, he stressed that figure was a ‘minimum’ and warned hundreds more could be built, not least because of the popularity of the village with developers. Parish clerk Amanda Bushell confirmed village councillors had objected to the Witham Road application and said they were also writing to ELDC about concerns regarding local infrastructure issues. 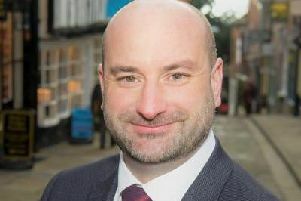 ELDC leader Craig Leyland, who is a ward councillor for Woodhall Spa, said he sympathised with Mr Keegan and other residents. He stressed there was a procedure in place for residents to object to applications and said he would pass on any concerns to relevant council officers.